The conflict is happening in a neighborhood that has grown dramatically busier since the spa first opened. For 40 years, devoted patrons have flocked to the healing waters of hot tubs on Northeast Everett Street. That's the home of the Everett House Community Healing Center, an alternative-medicine spa on a Portland residential street. Over the decades, it has grown to encompass a sauna, a steam room, flotation tanks, a tea house, and an acupuncture and chiropractic practice. 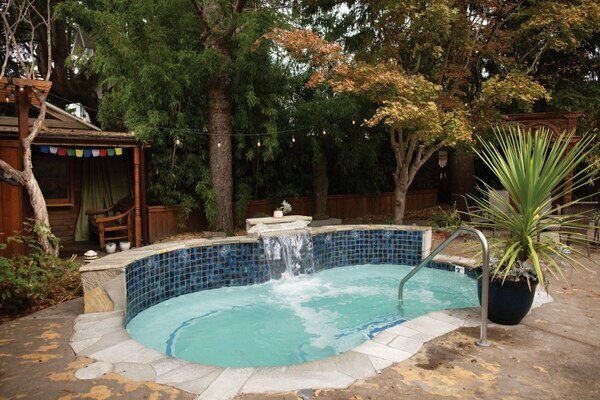 The centerpiece is a maple-shaded outdoor hot tub—clothing optional, with a recently installed waterfall. "It's our home," says Bob Czimbal, a motivational speaker and longtime member of the healing center. "It's our spa away from home. Breitenbush Hot Springs is two hours away. You can walk to this." Driving there is harder—the healing center has no onsite parking. For years, its owner worked around this problem, and complied with city zoning code, by leasing 30 parking spaces from a nearby medical clinic. But that clinic and parking lot have been torn down to make way for a 118-unit apartment complex with no parking. That triggered a city review of the permit that allows the Everett House to operate on a leafy residential block in Kerns. On Jan. 10, a city hearings officer denied the healing center's application for a modified permit. The ruling leaves the center in limbo. "I understand the direction our city is going in," says Everett House manager Judy Harrison. "But it's kind of ironic that the apartments aren't required to include parking and we are." At first blush, the Everett House looks like the latest victim of a citywide construction boom in which a new Portland gobbles up the old. But, in fact, the removal of a parking lot is just the latest tactical advance in a decadeslong war between the healing center and some of its closest neighbors. Where clients see an oasis, several residents along Everett and Flanders streets believe the center has grown into a commercial enterprise operating under the guise of a nonprofit—pushing the envelope of the types of business that may be conducted at a Portland home. They complain of kombucha trucks idling on the curb, customers loudly departing near midnight, and a seven-day-a-week hot tub party in their backyard. The conflict is happening in a neighborhood that has grown dramatically busier since the spa first opened, with the addition of a Starbucks, a Whole Foods and more than a dozen 28th Avenue restaurants. Even the most loyal Everett House acolytes concede the dispute is larger than parking. "People are using parking as a cloak," Czimbal says. "Not everybody likes people being naked in their neighborhood." 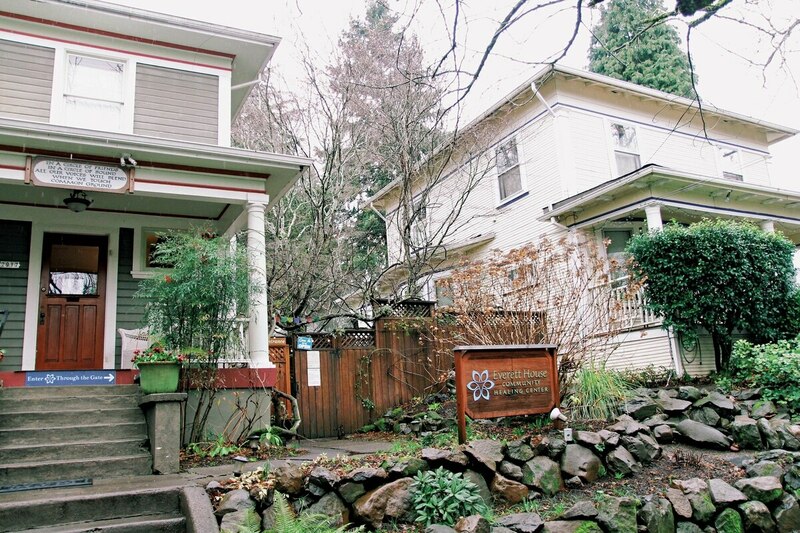 The Everett House Community Healing Center is actually three houses. Two of the two-story homes were built in 1906 on Northeast Everett Street. Another, built in 1904, sits on Northeast Flanders Street. The three properties total 16,000 square feet. From the street, less than two blocks from the restaurant row of Northeast 28th Avenue, the houses could easily be dismissed by passers-by as simply homes. They're distinguished by Tibetan prayer flags, a Buddha fountain, and porch-mounted poetry. A steady stream of customers in workout clothes enter and exit through a wooden gate. That foot traffic hints at the bustle inside. The houses—which each have basements—form a maze of showers, locker rooms and massage tables. Clients move from space to space wearing bath towels or nothing at all. They sip kava in the tea house, gather around a fire pit, or plunge into the hot tub, which sits in a central courtyard that links the three houses. "This is a place of healing and sanctuary since 1977," says its owner, Dr. Elliott Mantell, a chiropractor. "It's a place Portland seems to need. With all the new, small apartments coming in, people are going to need a backyard." A recent events calendar lists a buffet of New Age and alternative medicine offerings: yoga classes, meditation groups, reiki and tarot trainings, and a course called "Shamanic Healing Techniques: Connecting With Your Spirit Animal." Much of this has been allowed since 1982, when the center's then-owner, David Slawson, obtained a conditional use permit to operate a community club in a residential neighborhood. A city hearings officer placed several conditions on the permit—including that "a total of at least 30 off-street parking spaces shall be provided within 300 feet of the site for the exclusive use of this club." Not everyone approved. A hearings office report shows eight cases of neighbor complaints about the Everett House, dating back to 1998. But the center complied with its biggest responsibility, the parking requirement. It rented the required spaces from another chiropractor's office on Northeast 28th Avenue. But in 2017, developer Dennis Sackhoff's Urban Development Group bought that property. He razed the medical clinic, and is now laying the foundation for a four-story, 118-unit apartment building. That development provided critics an opportunity. If the Everett House couldn't comply with the parking requirement, the center's conditional use permit would need to be revised. Last summer, the spa asked city officials for a revision of its permit, allowing clients to park solely on the street. Dozens of neighbors appealed to city hearings officer Greg Frank, saying the healing center had long ceased to comply with its 1982 permit. "I don't doubt in the slightest that this place is very much utilized by a lot of people who really enjoy it," testified Leviticus Cole, a neighbor. "But this is a business in the middle of a residential street, and it's causing a lot of trouble for the people that live on that residential street." Healing center clients begged Frank for a new permit. "I have always been respectful of the neighborhood," wrote Joshua Ryan, who said he traveled to the Everett House by bicycle. "I arrive silently, speak in whispered tones and understand this is not a bar or party place or public pool. It is a sanctuary. 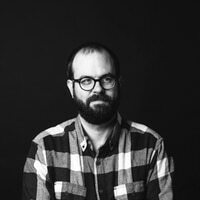 So much of Portland is being gentrified into nonexistence and many low cost, successful, community-building businesses are being shuttered or shoved to the suburbs where people like me cannot reach them." Frank issued his ruling Jan. 10. He expressed bafflement that a previous hearings officer had allowed the spa to operate in the first place with so few parameters. He denied the healing center a revised permit—and said to gain approval, the center would need to show its special events wouldn't clog neighborhood streets. It would also have to remove structures—including a gazebo used as a meditation area. And it would need to scale back its offerings, including its acupuncture, chiropractic services, flotation tank, yoga classes, and any workshops of more than 15 people. Neighbors were so ecstatic one of them posted the hearings officer's ruling in a front-yard wooden poetry box. Mantell is now seeking legal advice. The center remains open while he mulls an appeal to the Portland City Council. Meanwhile, the spa is trying to placate neighbors with quiet hours that include turning off the hot tub's waterfall at 8:30 pm. Members of the center remain optimistic. Yet the prospect of reducing their alternative healing services has them comparing the crackdown to religious discrimination. "It's like somebody saying, 'We're going to close down your school, your community center, your church,'" Czimbal says. "Because it's all of those things. It's like saying to a church, 'You have too many people on Sunday.'"